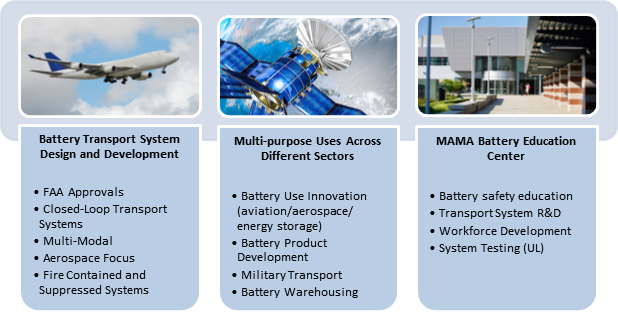 MAMA's Advanced Energy Working Group is focused on developing and deploying solutions that allow for the safe multi-modal transportation of lithium and lithium ion batteries. Michigan Aerospace Manufacturers Association (MAMA) welcomes Piston Group LLC, ESSPI, LIFT, JR Automation, Ausley and Schupan to its Battery Logistics Development Group. Battery technology, including lithium ion (Li ion) and lithium (Li), are quickly becoming the primary source for power demands world-wide. Li and Lion batteries are powerful, inexpensive, lightweight and environmentally safer than most alternatives. However, they present a fire and safety hazard which presents considerable shipping, storage and other logistics challenges.